Platinum SX2 32:1 100% Racing Synthetic is the ultimate two-cycle pre-mix engine lubricant, formulated specifically for use in modern two-cycle moto-cross racing motorcycles equipped with exhaust power valves requiring a 32:1 pre-mixed fuel-to-oil mixture. 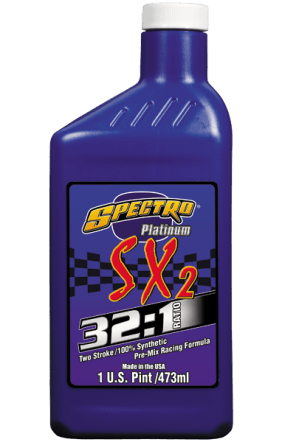 SX Platinum provides virtually smokeless operation and residue-free engine cleanliness. Meets all known motorcycle manufacturers’ warranty requirements and recommendations and exceeds JASO FD, ISO-EGD + and API TC.